Did 'Money' just hint at another comeback? 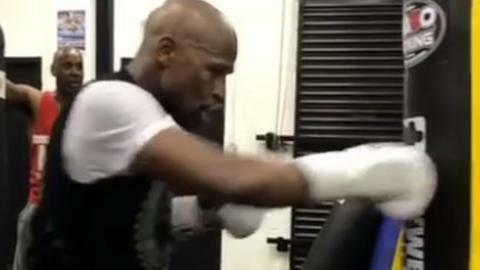 Mayweather, 40, has been back in the gym in protective gear - has he been sparring? 2017 brought us the circus of #MayMac but was that just the start? Rumours are swirling again after Floyd Mayweather posted a video of himself back in the gym, fully kitted out in pads and gloves. Is there a rematch with UFC's Conor McGregor on the horizon? Is there even an appetite for it? The answer to that is probably 'yes' considering the pair's August fight was the richest in history. Mayweather said he hoped to earn $300m (£232m) for that bout - that's almost $10m (£7.7m) per minute.